First, I want to thank you for your encouraging email message when I was at the beginning of my effort. My goal was to lose 15 to 20 pounds and two or three pants sizes. I also have a ten year old daughter, who I was having difficulty keeping up with, and wanted more stamina for my activities with her. At age 47 I had no expectations of attracting anyone’s attention at the beach; however, every year my pants size was embarrassingly increasing and I saw no end to it. When I hit 205 lbs I started researching the best way to do something about it. I happened to see you promoting Fitness Made Simple on TV and was attracted to the program’s balance between nutrition and exercise without expensive gadgets. 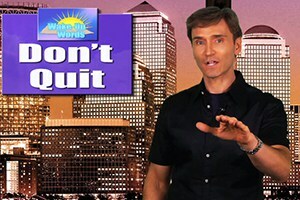 I ordered both the Fitness Made Simple and Six Pack Abs videos and joined my local athletic club. Having a family makes changing my diet and workout schedule challenging but I found the opportunity when my wife and daughter went away for 8 weeks to do some volunteer work in another state. Reaching my goals took dedication but your videos, the FMS Success Stories on your website, and your personal email to me inspired me to keep going. 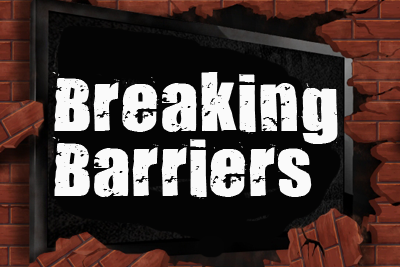 In just those 8 weeks I dropped from 199 lbs to 184 lbs and reduced my waist from 38″ to 35″. Most importantly, I like what I see in the mirror. One important thing to mention is that I was concerned about using fat burning supplements so my progress was achieved without their use…only the nutritional changes, 30 minute cardio workouts 5 days a week, the FMS weight training for one hour 3 days per week, and the Six Pack Abs exercises 3 days a week. With this letter I’m sending you a combined image of my before and after condition. I feel great, eat healthier, and have greater strength and stamina thanks to you and FMS! Thank you for creating a program that really is simple without being superficial. Fitness Made Simple works. 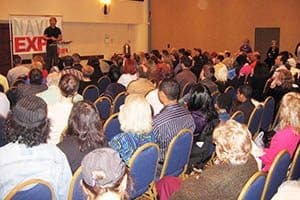 John inspires the crowd as a featured speaker at the prestigious NAVEL Health & Wellness Expo. 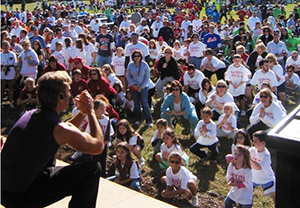 John encourages an enthusiastic gathering of families to live heart healthy lives. 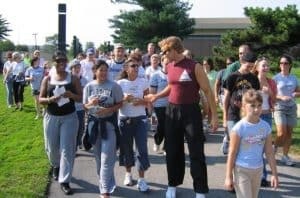 John speaks at and leads the American Heart Association Heart Walk, focusing on the benefits of exercise and nutrition in preventing heart disease. 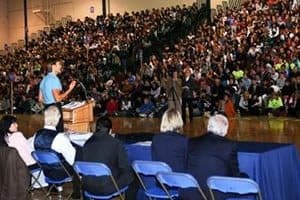 John performs his motivating keynote presentation to a packed audience at the Kids In Action Conference. 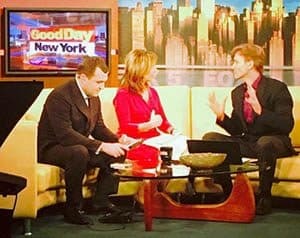 Good Day NY interviews John Basedow about his motivational Vine series, Wake-Up Words, and bestselling Fitness Made Simple videos and book.